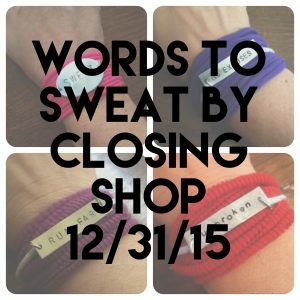 When I started Words to Sweat six years ago, the goal was to provide functional fitness accessories for people no matter their level of fitness. What started with a line of mantra workout towels grew into a company that also offered motivational t-shirts, infinity scarves, fitness jewelry, and humorous children’s tees. Like any good workout, there were tough parts, but the end result has left me exactly where I hoped to be. But also like any good health and fitness approach, it’s time to try something new. Words to Sweat by will therefore be permanently closing shop on December 31, 2015. To all of the fans and customers over the last six years, I have appreciated every purchase, comment, and piece of feedback you’ve shared. P.S. If you have a favorite mantra bracelet or necklace you’ve been waiting to buy, now is the time to head over to the Words to Sweat by Etsy shop and pick one up.